Chiapas: The End of Silence is Antonio Turok's striking visual diary of his experiences in this southern Mexican state, which is in many ways a cultural crossroads for the Americas. The region is marked by centuries of conflict between modern society and the indigenous communities--the most recent of which was the uprising in 1994 by the Zapatista Army. With this struggle, which continues today in search of a peaceful settlement, the Maya Indians ended their centuries-old silence, and captured the imaginations of leftist activists around the world. While they cannot help but reflect the politics of the region, Turok's photographs transcend mere reportage, echoing the rich history of Chiapas. His portraits of the many different lives and rituals--from religious festivals to country funerals, from high society to homelessness--offer a multifaceted view of a social environment so complex as to resemble a hall of mirrors. 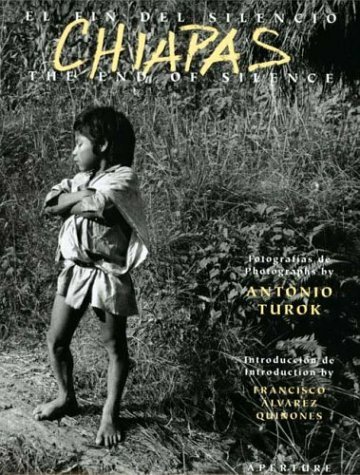 There are sixty-four black-and-white images in this book, along with personal commentary by Turok and an introduction by Francisco Álvarez Quiñones, Chiapaneco poet and playwright. Detailed captions in English and Spanish appear at the back of the book. If you have any questions about this product by Brand: Aperture, contact us by completing and submitting the form below. If you are looking for a specif part number, please include it with your message.